Dienes and polyenes are an extremely important group of chemicals in the investigation of different types of syntheses. Dienes and Polyenes are found in a large number of natural and man-made products including such natural products as terpenes, cholesterol, Vitamin A, and many essential oils, as well as many polymers and rubber products. In recent years the organometallic complexes of these compounds have been found to play an important role in synthesis. 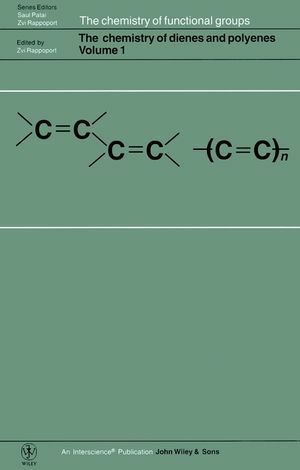 This volume is an invaluable reference source for researchers in academia and industry in organic and natural product chemistry and materials science. An extensive work covering all aspects of the synthetic analytical, biochemical, physical, and environmental aspects of these important molecules. Contribution of Quantum Chemistry to the Study of Dienes and Polyenes (V. Branchadell, et al.). Thermochemistry of Dienes and Polyenes (J. Liebman) Radiation Chemistry of Dienes and Polyenes (Z. Alfassi). Analysis of Dienes and Polyenes and their Structure Determination (Z. Aizenshtat). Radical Addition to Polyenes (H. Zipse). Structural Effects on Dienes and Polyenes (M. Charton). Allenyl and Polyenyl Cations (L. Subramanian). Synthesis and Transformation of Radialenes (G. Maas & H. Hopf).